Lythrum californicum T. & G.
Stems: Erect, 1 to several, slender, branched. Leaves: Lower stem leaves opposite; upper stem leaves mostly alternate, reduced, sessile, linear-oblong to linear-lanceolate, 1/2 to 1 inch long, less than 1/3 inch wide, pale gray-green, waxy, firm to fleshy; margins entire. Inflorescences: Numerous 1-2-flowered clusters, sessile in leaf axils. Flowers: Calyces 6-lobed, lobes alternating with 6 appendages; corollas purple; petals 6, about 1/4 inch long; stamens 6. Fruits: Capsules, cylindric, ribbed; seeds many, tiny, egg-shaped. Habitat: Wet soils of ditches, draws, lake margins, and roadsides. 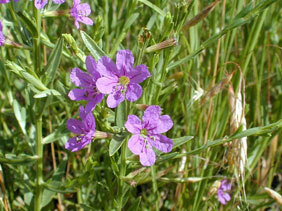 Comments: California loosestrife is similar to winged loosestrife (Lythrum alatum Pursh). Winged loosestrife is taller and has egg-shaped to oblong, dark green leaves that are thin and pliable. Purple loosestrife (Lythrum salicaria L.) is an introduced ornamental and weed that spreads aggressively in wetlands; it has been declared noxious in several states. California loosestrife differs from purple loosestrife in that it has solitary or paired flowers in the leaf axils rather than many flowers in terminal spikes that purple loosestrife exhibits. Also, California loosestrife has 6 stamens rather than 12.